Paul Meekin, award-winning Creative Director of Paul Meekin Hair, Belfast, has been creating head-turning hairstyles for more than 35 years. Bringing passion, flair and creativity to every style he creates, he has worked as an ambassador for several major brands and is now a passionate and proud ambassador for all the Revlon Brands in the UK and Ireland. After starting his career as a teenager and Saturday boy in a local salon, he trained at college and worked his way up to become one of Belfast’s best-known stylists, with his own salon and a long client list that includes celebrities, models and loyal locals. Known for providing the personal touch for everyone whose hair he transforms in his East Belfast Salon, his warm personality ensures that he brings zeal, energy and enthusiasm to every appointment. 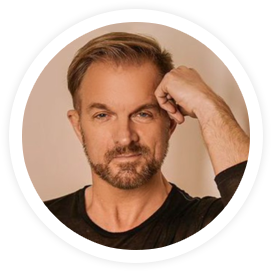 With Paul’s extensive knowledge and experience in all aspects of hairdressing, he takes pride in listening to his clients, producing or adapting styles to suit their lifestyle. This hands-on approach also sees him helping to develop young talent and pass on his expertise during his salon’s trainee nights.